Things that go fast are cool. I’m sure that that’s one of the Laws of Thermodynamics. Since slot cars are made to go fast, in a slot of course, they are cool (I can verify this as I had a few as a child). Because the cars are guided by that slot though, and held down by a magnet, they don’t need any real suspension to stay on the track, so they don’t have any and therefore look rather static when going around corners, which is not so cool. So AnonymousSwaggerEngineer at chase-cars.com set out to change that by printing a chassis that has suspension infused with the swaggering physics of the 70s. The chassis was printed in Shapeways’ Hard and Flexible White Nylon so it’s resistant to the vibration and heat of the motor, and fitting all of the parts into a small volume reduced the costs enough that s/he could tweak the design and reprint several times to optimize the intended suspension effect. 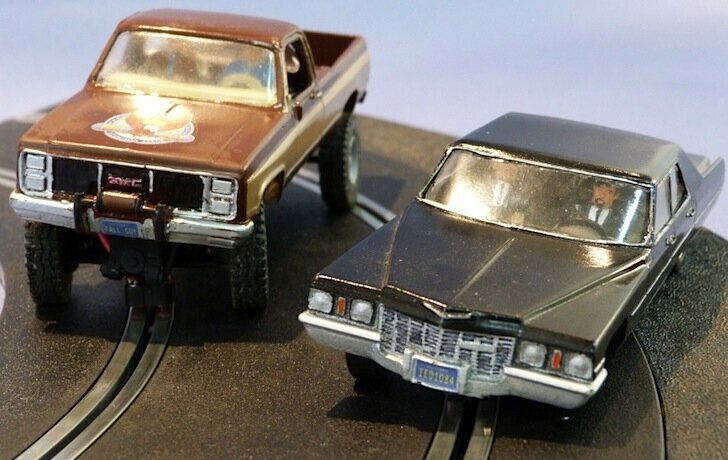 3D printing makes this type of quick, affordable, custom, and successive-but-unique-builds manufacturing available to the hobbyist, whether it’s slot cars or DIY drones, the bodies and many of the mechanical components are printable. Hobbytown charges $30/hour to repair radio controlled cars/trucks/planes/etc, plus parts; it will be cheaper than that to print a broken chassis component in a lot of cases, so I expect to see much more 3D printed RC and drone activity in 2013, and I’m a fan of both.